Imagine my excitement a few weeks ago when I found out they were opening a Habitat Restore in my town! OMG! I was so excited I could hardly wait for them to open and was there just after the doors were unlocked! If you have never ventured into a Restore, go! NOW! And go often as the inventory is always changing. I picked up several things on my first trip. 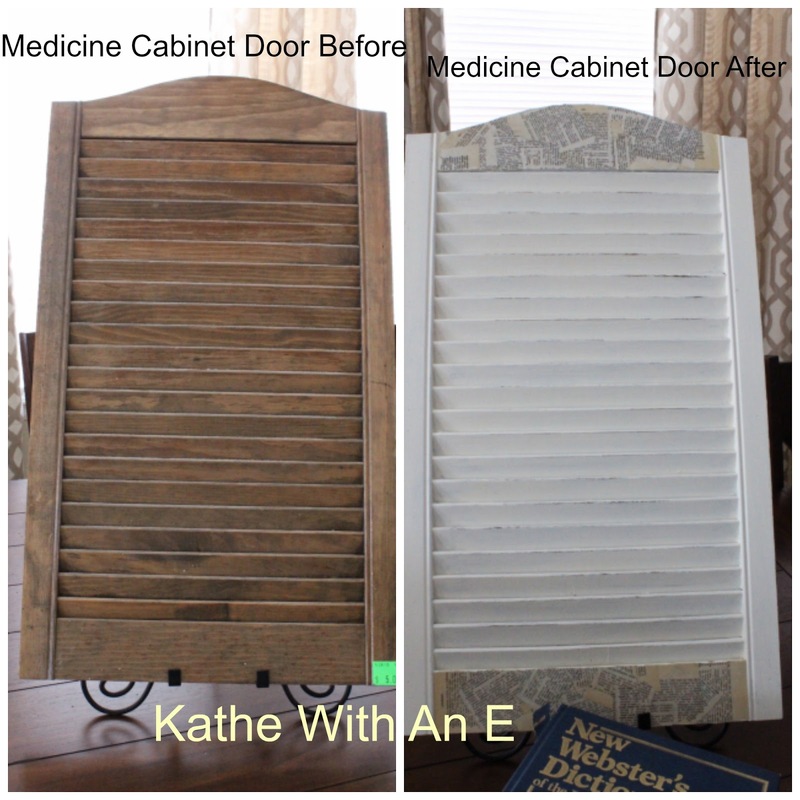 One was this wooden louvered door medicine cabinet. 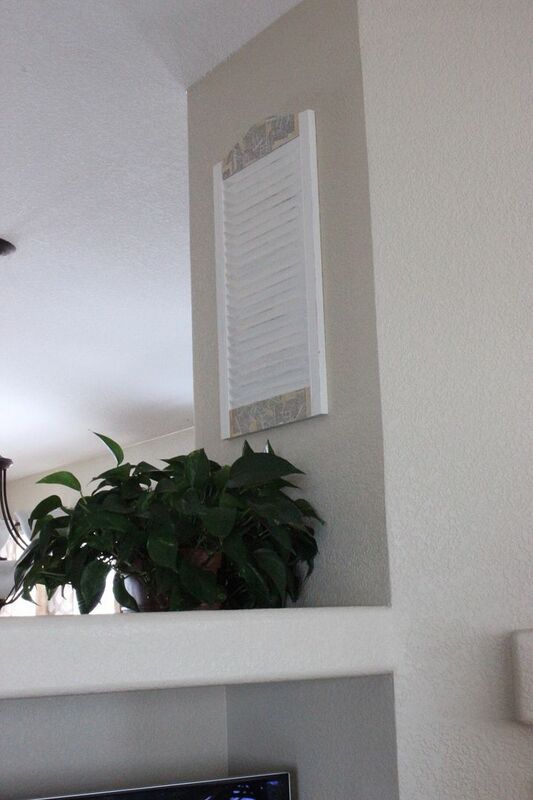 I have been on the lookout for some small shutters but have been denied ever finding any. When I saw this medicine cabinet my motto came into play. It is not what it is, but what it can be! In fact, I was so excited I forgot to take a photo of the full cabinet. I had already taken the door off and put the metal box in the recycle trash and it was on the truck before I realized my bloggy mistake! Anywho, for the price I paid, I was more than happy with my purchase! Of course, I couldn't leave it in its dark stained state. Plus, I have been wanting to show my MIL the wonders of chalk paint. So, I gathered my materials and we gave it a new look. A few years ago I had transformed a thrifted nightstand with homemade chalk paint and you can find the recipe for the chalk paint in that post. I find it to be so simple to use and I love the finish it creates once you give it a coat of finishing wax. Linda, my MIL, just loved helping me and can't wait to give new life to a project of her own once she finds her own home! 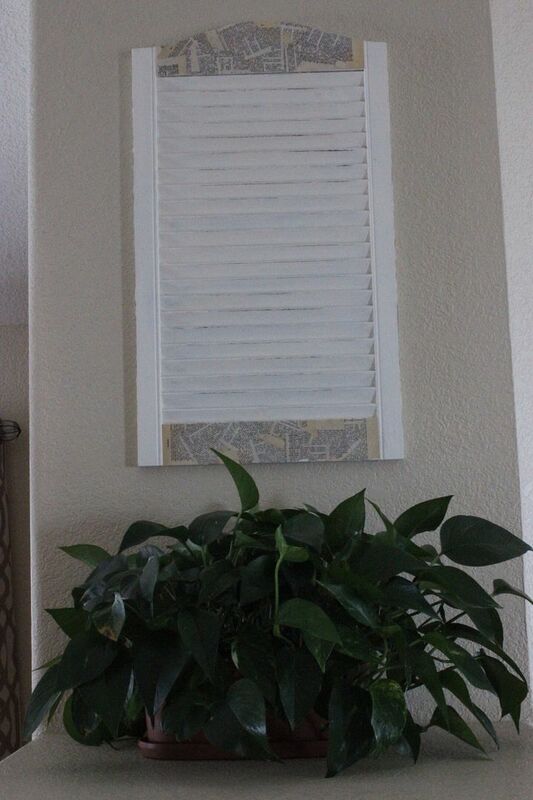 Once we had painted on two coats of the chalk paint and wax, and distressed some spots with a sanding sponge, I decided my shutter needed something more. 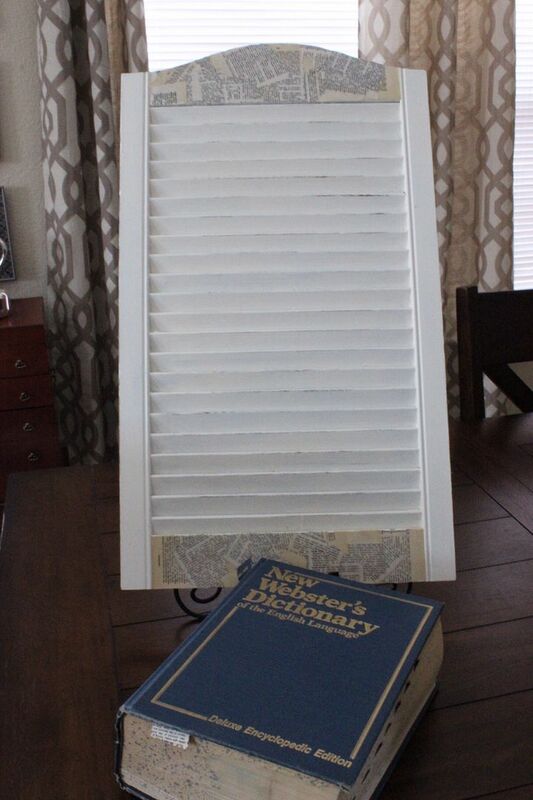 So, I took a few yellowed pages from a very used dictionary I had, tore them some and glued them to the top and bottom of the shutter. It is exactly what the small wall above the TV alcove needed! Total spent? 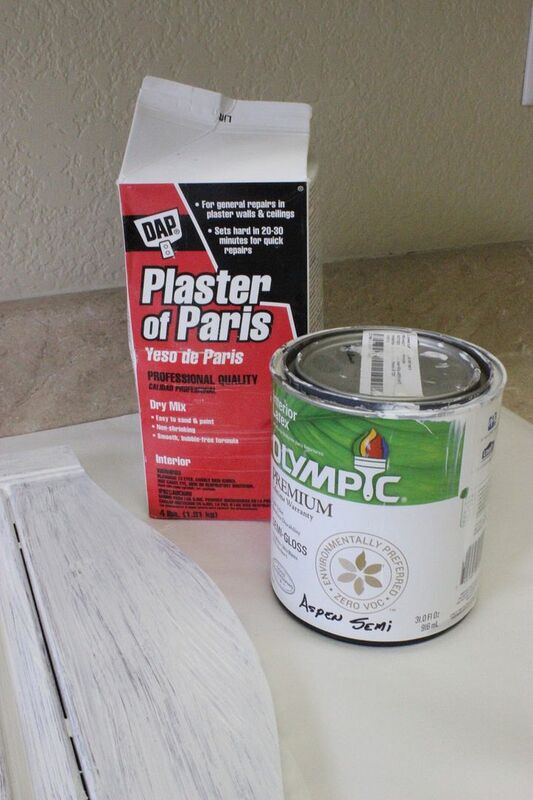 I already had the paint, plaster of paris and brushes on hand so, just $5.00 for the cabinet! My kind of thrifty decor for sure! Remember, I said earlier I picked up "several items" at the Restore that day. You'll have to keep checking back to see what else I found to make over! You're gonna love it! Love it! 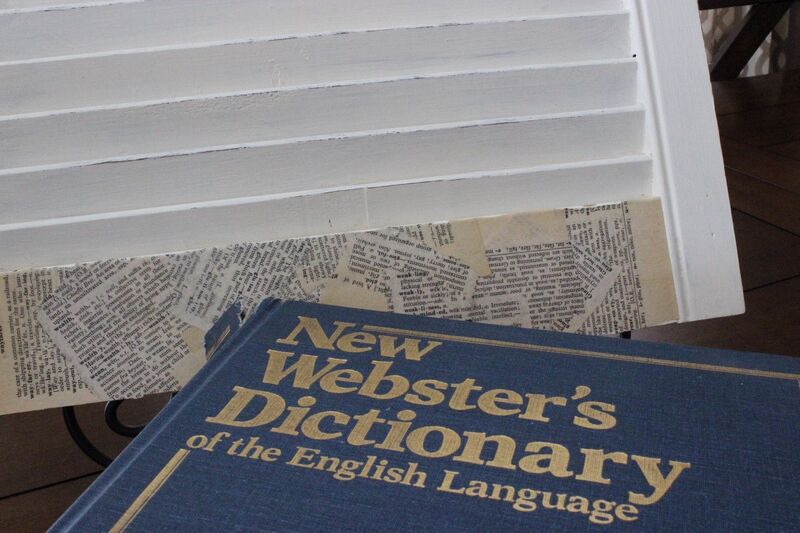 What a great idea to use the dictionary pages! It is so cute! Kathe! Love it and how it looks there in the alcove! 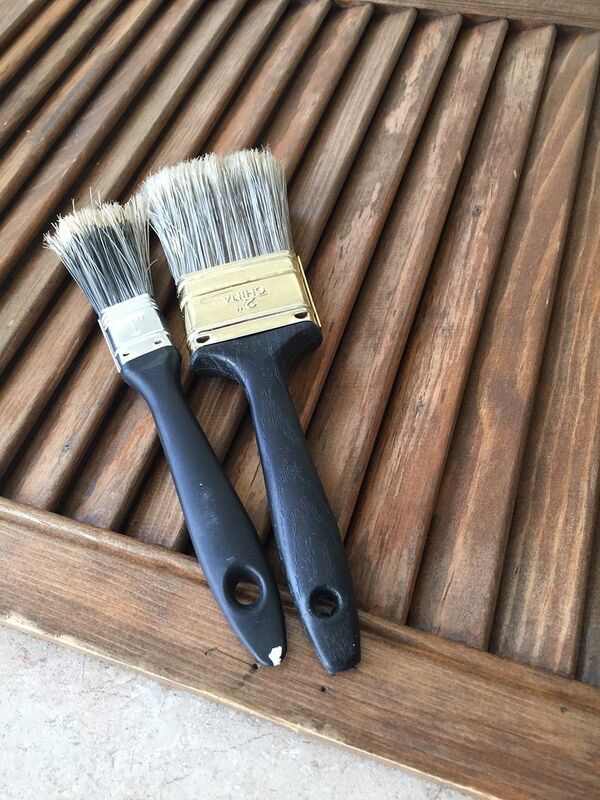 I have a cedar chest I want to paint so I may try your recipe for chalk paint this spring. Kathe that is really cute! You are so creative! Beautiful! I love the transformation. You are always so creative! I have never been to (or even heard of) a Restore, but now if I ever come across one I will duck in! I love it!! The book pages made all the difference. Oh, I LOVE ReStores! Sadly, the nearest one to us is in the city, two hours away. Very cute use of the pages. You're so dang creative Kathe, love it! 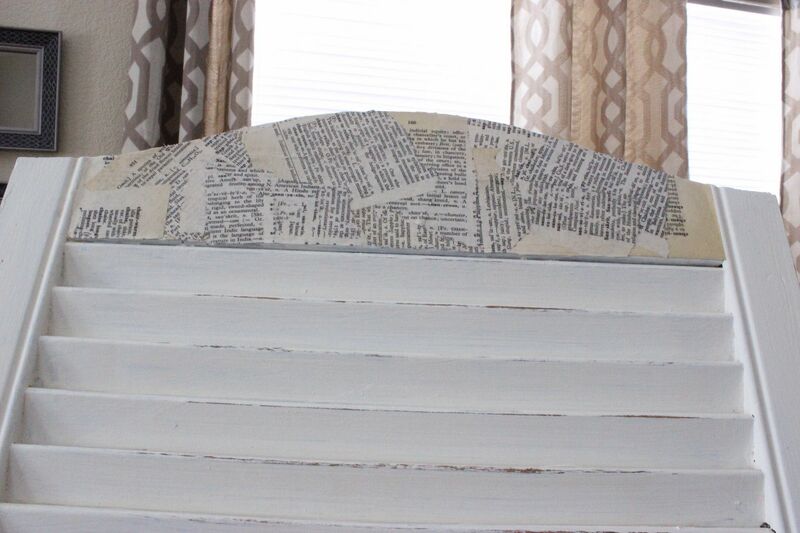 Love how you dressed it up with the torn book pages. You are so clever. Great find Kathe and love how you dressed it up. Restore rocks! 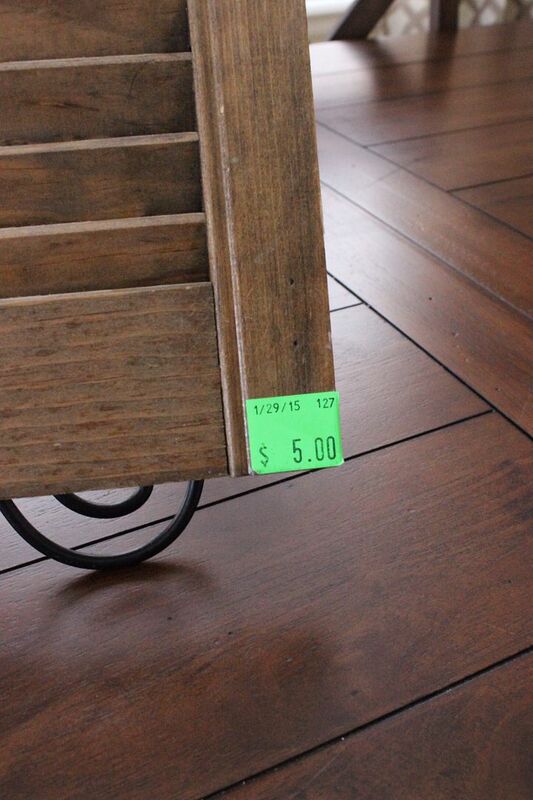 So cute and cost efficient- what a great idea, thank you for sharing. I stopped by from Tuesday at Our Home. I have a restore right down the road from me and have yet to venture in. I think I will need to do that very soon! Thank you for sharing your shutter with us at Merry Monday! Well, aren't you the clever one! Five dollars and a dream. And look what you made. You're right. It was meant to go in that spot. I'm going to have to get a handle on this chalk paint thing that's so popular. I'm going to your nightstand post right now. I love this, Kathe. Very cool. So adorable! I'm pretty sure that the ReStore staff will know you by name very soon, Kathe. Thanks for sharing at the This Is How We Roll Link Party at Organized 31. What a cute idea! 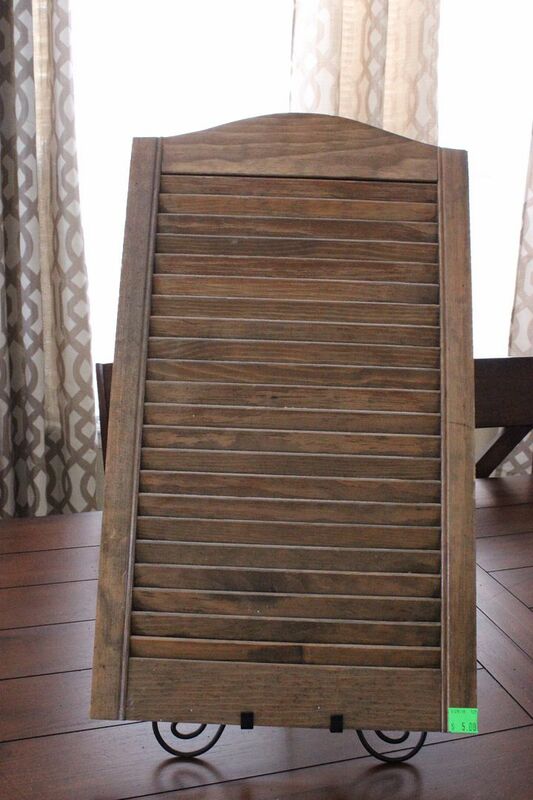 I love the look of these shutters, and it made a great addition to your bathroom. Plus it was so inexpensive! Thanks for sharing this idea with Hump Day Happenings. I have a shutter I found last fall, haven't been able to figure out what to do with it. Guess I just figured it out! Thanks Budde! Super cute Kathe! I love shutters and am always on the look out for them. I picked one up for $5 similar to yours a while back and painted it white. Been a great back drop when I shoot photos. I want some tall ones. Actually have found a pair twice but both times it was when I was not able to get them home. Maybe next time. lol! thanks for sharing with SYC. This came out so cute. I'm so happy to see you this week. Thanks so much for sharing with Adorned From Above's Link Party. Have a great week and I look forward to seeing what you you have for this week's party. Nowadays' bodypiercingsavedmylife.comkin are losing trust on allopathic medicines due to their unsafe and negative impacts alongside astonishing charges and cost in treatment. Health supplements needn't bother with medicinal supervision, nor Food And Drugs Administration endorsement.